And it's ready for mass production. One of China’s leading defense contractors NORINCO has entered the international drone export industry with its new armed drone. 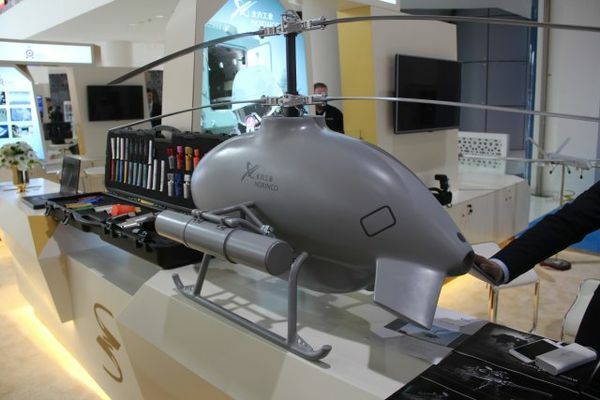 The company unveiled the Sky Saker H300 at the International Exhibition of National Security and Resilience in Dubai. The Sky Saker H300 is a 200 kg (440 lb) helicopter UCAV with a coaxial rotor. It’s equipped with cameras that have infrared and electro-optical systems, and it is capable of laser targeting. It also has two missile launch tubes on each side and possibly a version HJ-10 anti-tank missile (or the more compact 16kg TL-2 missiles). More interestingly, the Sky Saker is able to make midcourse corrections for guided munitions launched at it, like cruise missiles and shells. The drone’s ground control station is expected to be integrated into the Chinese military systems, which will make it an invaluable asset for urban combat situations and counterinsurgencies. The system is also well suited for hunting ships and other vehicles. The Sky Saker H300 joins the ranks of China’s other unmanned drones, the CH-3 and CH-4, both of which are already being used by countries like Nigeria and Iraq (the CH-4 drones have seen wide use in conflicts in the Middle East). With a smaller frame, cheaper price tag, and vertical takeoff capabilities, the Sky Saker H300 is an ideal weapon for use in less-open environments, like cities and jungles. And with its onboard targeting systems and payload capability, it can carry out reconnaissance missions as well as precision strikes using its fire-and-forget missiles. We’re expecting to see more and more UAVs made for military use as more boots are taken off the ground in favor of drone technology, but drones like the Sky Saker H300 may be opening the doors for these military drones to be used in more challenging environment. And these drones are starting to bring their own guns.